I started to forget about not being able to do it by doing it... It wasn't just the race, but relief that out of all the crap in my life that I couldn't control, this one thing I set out to do, I did. The time would break no records. It wouldn't even get me close to qualifying for the Boston Marathon. I finished in the middle of the pack. But none of that mattered. In running, the only markers you try to beat are your own, and I had done it. Sure, these quiet moments of reflection and appreciation appealed to me as a runner--but they also speak to the larger draw of running as a sport and a challenge. 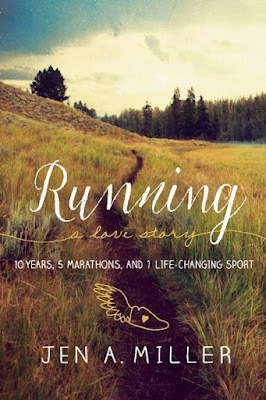 But that's not to say that her writing will appeal only to other runners. Quite the contrary; her story is the story of an everyman (or, technically, everywoman) pushing herself to try something new and do something different and, ultimately, shape the life she wants. That larger appeal is evidence of Miller's experience as a writer and a journalist. Though Running: A Love Story is one very personal story of one woman's journey to distance running, it's universal in its appeal and its honesty about love and running and everything in between. Thank you to the publisher for providing a copy of this title for review.